VANCOUVER — The scoring slump was over, but the questions remained for Pierre-Luc Dubois. 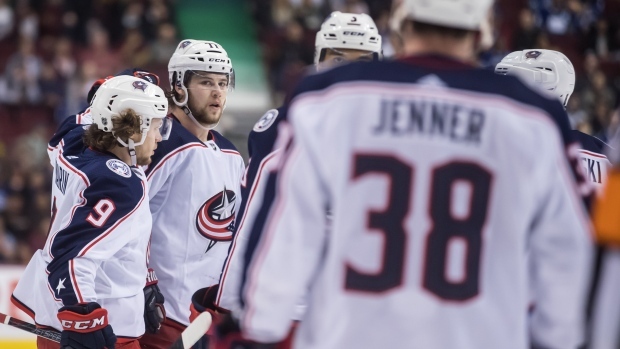 Dubois had a goal and an assist as the Columbus Blue Jackets pounded the Vancouver Canucks 5-0 Sunday night to improve their NHL playoff chances. Dubois was still looking for answers after going 11 games without a point and being goalless in 13. "I've never been in a slump like that probably in my life," said the Blue Jackets’ first-line centre. "I have been in a slump where I wasn’t playing well, and I wasn’t getting points and didn’t wonder why because I wasn’t playing well. Josh Anderson scored twice and added an assist while goaltender Sergei Bobrovsky returned from injury to stop 21 shots as the Blue Jackets (41-30-4) moved to within two points of the Montreal Canadiens for the second wild-card spot in the Eastern Conference. Columbus also snapped a three-game road winless streak. Columbus took the ice knowing they had a chance to make up some ground after the Canadiens lost 2-1 to Carolina in overtime. "We needed a win tonight," said Anderson. "You look at the standings and every team is winning, not really helping us out too much. Ryan Dzingel and Oliver Bjorkstrand also scored for Columbus. "I felt pretty good," said Bobrovksy. "I felt comfortable to play and I thought the guys helped me a lot out there. It’s a good team win." Dubois’s goal made it 2-0 with just 56 seconds gone in the second period. Artemi Panarin picked off a Canuck pass then fed Dubois, who scored on a screened shot. While Columbus celebrated being a step closer to the playoffs, the Canucks were left trying to explain a step back. Vancouver had played a strong game in a 3-1 loss to the Calgary Flames Saturday but made costly mistakes and lacked emotion against Columbus. "That wasn’t our strongest game," said Horvat. "We knew they were going to come hard. They just kept coming and coming. "We couldn’t get any traction. We have to be a lot better than that coming down the stretch here." The Canucks (32-34-10) trail the Colorado Avalanche by seven points for the final wild-card spot in the Western Conference with six games remaining. It was the 10th time this season the Canucks have been shutout, the most of any team in the NHL. It was also the 16th team Vancouver has allowed five or more goals in a game. The Canucks trailed 1-0 after the first period. A couple of costly turnovers resulted in Vancouver falling behind 3-0 with just over six minutes gone in the second. "I actually thought the first period we came out and had an emotional, intense, physical period," said Canuck coach Travis Green. NOTES: Left winger Sven Baertschi returned to the Canucks lineup after missing 53 games with a concussion. … Recently signed Canuck defenceman Quinn Hughes, out with an ankle bruise, skated Sunday but head coach Travis Green says he needs a couple more practices before he can play. … Forward Josh Leivo missed the game due to illness. … Defenceman Derrick Pouliot returned to the lineup after being a healthy scratch for six games. … There were boos midway through the first period when no penalty was called after Anderson hit Canucks defenceman Alex Edler from behind into the boards. … Vancouver centre Tyler Motte left the game with an upper-body injury.